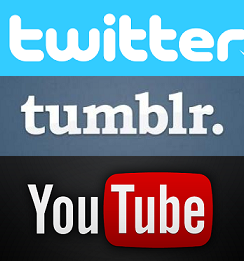 I made a new banner ^^ You guys like? I change the banner because I really didn't like the previous one. This one is simple and set for now. Featuring Niki Chow. Another talented and beautiful Actress and Singer. Wow, foreverloveTVB will be four in June and its coming right around the corner!! -Thoughts so far for Gloves Comes Off? 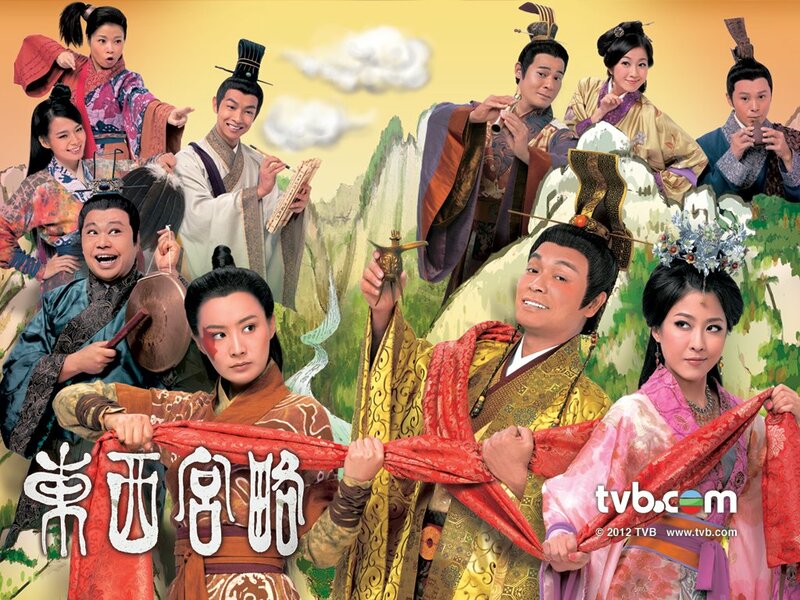 Battle of the Senses (五覺大戰) is one of TVB's Variety Show. A game show that they invite artistes to participate in games. Battle of the senses is host by King Kong, Chin Ka Lok, and Timmy Hung. It is broadcast on Sunday's at 9pm. Basically, I thought Battle of the Senses is pretty funny to watch and it reminded me of Super Trio which I enjoyed so much. Give it a try =] and I especially just love the black room..lol. P.s. even though I enjoy watching the black room, I think its kinda mean to have the girls enter that room. =P I really wonder what they felt afterwards? lol. 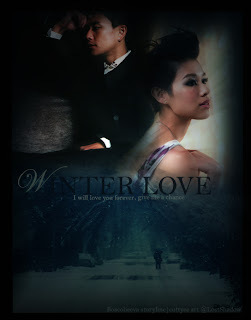 I just updated chapter 7 on "Winter Love"
Beauty from the Heart will always last longer and forever than Beauty from the Face. Physical beauty will fade in time; true beauty from the heart will be forever. Doesn't matter how beautiful one is, with an ugly heart, the person is ugly overall. Virtue is always greater than beauty. Inner Beauty is more important than Outer Beauty!! I actually don't really know what to say about this series. I think its just alright and not a series that you have to watch. It's a very simple and easy go type of series. I have mixed feelings with the series but I won't say its a horrible series. The series is simply just alright not too much and well maybe you will get bored of it in the middle. (I did that is why it took me so long to finish it -.- lol.) Aside from being boring and pointless of this series, it gives off another great lesson. The theme from the series is "Beauty from the Heart is more important than Beauty from the outside." Inner beauty is greater than outer beauty. I have to say that I like the costumes very much. Queens of Diamond and Hearts is taken place in one of the earliest kingdom in China. The costumes were really pretty and simple. Nothing too fancy but, I have to say Sharon's clothes was too much. I didn't think that costume was part of that time period. So I was bit confuse why she is wearing a different style than Fala and others. I also love the accessories and the style of the hair. It was so simple and beautiful reminded me of Step into the Past. The princess there had a very simple outfit like the two Empress in Queens of Diamond and Hearts. One thing I like about the earliest kingdom is that everything was so simple and pretty. At first I thought the series was only going to base on comedy. Everyone loves everyone and there will be no backstabbing and trying to raise to the top. But, I was wrong. I guess in all Royal Courts series, there will always be fights and backstabbing. Basically the whole series was about Ben's character try to rule the kingdom but each time it fell because of Fala. Sharon was quite annoying, I don't know what she wants. This minute she was all nice to Fala and the next she is mean. And her family, omg they were so annoying and hated their part so much. What I liked was that Fala and Roger slowly liking each other and finally Roger saw the beauty from Fala. He finally realize that inner beauty is much important than outer beauty. When the soul were switch we get to see the serious Roger trying to rule the country. On the other hand, Roger can finally see the difference from Sharon and Fala when their soul were switched. Another thing I have to say was Yoyo's character. What is her problem and what is her part of the series? I felt like she is nothing but just to be there and look pretty and be the Prince's wife. I don't know what was her problem, this minute she is helping Sharon the next minute she was helping Fala. Basically, I really have nothing to say about this series. The other casts were pretty funny and the series gives you laughs here and there. Koni really stood out because she is way too tall for an ancient series. I believe this was her first ancient series. I hated how Sharon and Roger didn't believe Fala and Roger sentence her to death. And I have no idea how you can forgive someone just because a tattoo? I guess, Fala can forgive him because she loved him too much and when she saw the tattoo she was happy. So basically guys, Inner Beauty is Much Important than Outer Beauty. Beauty will fade in time but the beauty coming from the heart will forever remain. It's alright. Give it a go if you have time. From watching the serious On Call 36 and jump to watching a non-serious Daddy Good Deeds; I find this series rather dumb. Yes, this series is nothing but just bunch of laughter; I thought it was such a great idea to air this right after On Call. It helps us to relax from all those tensions. Daddy Good Deeds is a perfect series for family sitting together and enjoy and such a great stress reliever. There was nothing important or serious events happening. It was simply just laughter. Even though I thought the series was kinda dumb, I had actually grew to enjoy and love the series. I love how each of the characters had grew into a lovely bond. I love and enjoy watching the family stick together and go through thick and thin. I really had developed that emotion and bonds as I was watching the series. I felt like I also had become part of the Ko family. I was laughing when they laugh, cried as they cry. It had been such a great couple of weeks with this family. This family really had went through so much with each other and when the last episode had rolled around, I really didn't want to let go. I truly had grew some bonds with it. I definitely had grew into loving the characters also. I simply just love Daddy Lam whom is played by Chow Chung. He is definitely one of the amazing and best veteran actors. Hope he can get the Lifetime Achievement Awards this year or definitely some recognition. I love him from the first episode to the last. His expressions were definitely amazing and cute. I especially loved how he laugh at the last episode. He was so happy that he won some amount of dollars from the lottery which doesn't worth much. He is just such a great cute grandpa. Another Daddy I love is daddy Ko whom is played by Ha Yu. I simply love watching Ha Yu and Paul Chun playing a father figure. They both give such a warm love to the family and gives me such a warm and cute father love. Daddy Ko stands up for his children no matter what. He stays and go through thick and think with them no matter if its a happy or sad event. He didn't care if his children are running his blood or not. Raising them is most important. He didn't care if Brother Ko was adopted and he still love him as his own biological son. I definitely had felt that pain when I saw his sad eyes when brother Ko and his mom met. Daddy Ko was definitely scare that he would lose a son. I totally understand that he wants what is good for his daughter. But, I was a bit object that he didn't let Steven be with Linda. Not all men who can support his family financially is a great man. Steven is a guy that would do as much as he can to support his wife and family no matter what. But over all I love Daddy Ko and Daddy Lam. Brother Ko and Sister in-law Ko was pretty sweet. They step in and help their siblings no matter what. Even though brother Ko realized he wasn't their biological brother, he was still willing to step in and go to jail for the father. He does anything an older brother would do for his younger sisters. At first I thought Nancy would be those typical wife that would be annoying and going through people business. But, I was surprise that she help the family and stands in for them too. She loves the Ko family very much as well. Sister Ko and little sister Ko who are just regular little sisters and daughters that were spoiled and love by the family. At first I thought Linda was the adopted one I guess it wasn't after all. Both Linda and Cilla would step in and help the family. They have each other backs and would not let each other and any of the family members fall. First, I thought that Cilla would become an celebrity but I guess she didn't and I was wrong. I liked how she finally "woke up" and became mature. She wasn't bratty after all. Linda was simply really cute. I really reckon that Linda has the face and expressions to be in a comedy series and play a cute character; like Twilight Investigations. She was the one that definitely had kept me laughing. I like her CID position more, it definitely suited her. I liked her wardrobe but definitely dislike her hair. Even though I thought that Steven and Linda pulls better as a sister brother relationship, I definitely had enjoy them as lovers. I really going to miss this couple and I ship them as lovers. They are definitely really cute and adorable together. I really like Steven's interview on his three sisters. It was sweet. I was waiting for them to get together and was a bit upset that we didn't get to see them as lovers longer. I was also upset that they didn't focus on the love triangle at all. It was just like I like her and lets fight for her equally; and Steven ended with her and that was it. It was a downside but it's alright. I thought that it was kinda unnecessary to add in that uncle part. That part could have been easily taken out and focus the love triangle right there. The ending was cute and I was waiting for the Disneyland scene. But that was just for the cast to have fun and for the promo and theme songs purposes. Definitely I love Ah Yap, we can't forget about him. I love his expressions and he was just another funny character. I laughed so hard that they thought he was gay. But it turn out he is straight and ended up with Viven Yeo. I really enjoy watching the little sub series in Daddy Good Deeds. I liked how Mui Siu Ching had showed us some talents that the artists can do. Like, Steven and his badminton, Linda with hoola hooping. Cilla and Edwin can sing etc. I like how they had incorporated so many of past works from Mui Siu Ching and many of guest appearance. The guest appearance were willing to take part because they want to be in the last production of Siu Ching jie. It was sweet of them and Siu Ching Jie. At first I thought the rhyming and finishing each other sentence was annoying but I got used to it. And lastly I was happy for a good result and a good rating. It was definitely one good present for Steven and Siu Ching Jie. I definitely wish Steven, Mui Siu Ching and Lau Ka Ho all the best!! I'm going to miss them as they are my favorite producers and Steven as one of my favorite actors. Definitely my favorite part were the Ng clips at the end! It was definitely funny and a good way to end the series like that! This was the last series of Stevinda couple as their first series together was Virtues of Harmony II. Linda's first series into TVB was with Steven as Steven's last series with TVB was with Linda. Cast: Kevin Cheng, Raymond Wong, Selena Li, Natalie Tong, Nancy Wu, Kenny Wong, Power Chan, Edwin Siu, etc. News Update: Steven Ma: Most Worried of Linda Chung Getting Bullied! Steven Ma is a singer turned artist, who entered TVB 19 years ago. Eventually, Steven reached up top becoming one of the first line TVB Siu Sangs and has filmed countless series over the years, but didn't really have rumors. He has a deep relationship with the three FaDans Tavia Yeung, Fala Chen and Linda Chung. Due to having rich life experiences, Steven often coaches the three girls and unconsciously took on the role as their Big Brother. Over the years that I've been with TVB, aside from my three god-sisters Tavia, Fala and Linda, many other artists including Kenneth Ma calls me 'Big Brother'. However, I get along most with Linda, Fala and Tavia, we have collaborated the most and have the most fate. When I first met Linda, it was in 2004 when she was shooting her first series, Virtues of Harmony, she played a couple with me. In 2007, Fala played my little sister in Steps and in 2009 Tavia collaborated with me in Sweetness in the Salt, where we played a couple and started getting more familiar. Although we never formally became god-siblings, we have a very good relationship. We often chat and I'm more than willing to help resolve any problems they might have. I admit that I am very good at keeping secrets. Whenever they have something to tell me, I will just sit back and listen. Even if I do give them advice, I would turn around and forget it. Once my little sisters finishes venting, then they'll be ok! And whenever there are things they want me to help deal with, I would really put out my heart to help them. I believe it is because of this that they were able to put down their guards towards me. Earlier on my birthday, my three sisters came to celebrate with me too! I've once said to them, if they ever encounter someone bullying them, then must speak up. I won't let anyone bully my sisters! Although I'm not a martial artist, I will help as much as my capability allows me to. I will pursue justice without any second thoughts and just go help them. This is my promise to them! In fact, they all give me a different feeling. Ah Yi (Tavia) is a very independent woman and also has the least problems among the three. I don't need to worry about her! She is a person that will come running to me when she sees me from a far. Compare to the other two sisters, her personality is much more tomboy, and is rather mature. Our relationship really feels like brotherhood, haha! Although I don't get to see her much, I still love her very much. Fala appears like a little girl in front of me, but she's a very straightforward person, so much that she may even offend people and won't know. I've seen her relationship with reporters not go so well before. Her communication style with the media is a little strange... so I often try to advise her as a big brother. For example, the tone she uses is not too good, I would tell her to change the way she expresses herself. Fortunately, she listened to me and has really reflected on herself based on my advice. Because artists' relationship with the media can be considered closely related, we must mutually show understanding and provide support. For whatever it is, we should not be too stubborn! Recently, I have seen improvement from her. Last week, I talked to her on the phone and told her my experience, that others may not accept your first reaction! Although it is said in order for a person to be slick and sly, they must lie, but in fact I cannot accept that. I will choose another method to handle this: I choose not to say it! Then I don't have to lie. I know Linda the longest, but she is actually the one I'm most worried about. One time, she messaged me on Weibo and told me that she's a big girl, but I am still worried because Linda is too naive, too simple and can easily get bullied! It's fine working at TVB, a 'greenhouse' that provides maximum protection, but if she were to head out to work elsewhere, then it will be difficult. I watched Linda come into this industry back then. One day we were having a meal together, and I urged her whatever she learns to do, do not learn to be bad, don't do 'dirty' things. Must maintain a pure heart. Linda has been able to do this all along, and has been improving on her acting. I am very grateful. Perhaps, I am used to looking after my siblings at home, so my words may sound a little old-fashioned and feel like a father, but I am fortunate to have found three sisters that I could respect and love, and vice versa! Aside from my beautiful god-sisters, I actually have three good brothers too: Evergreen Mak, Dexter Young and Lam King Kong. We have known each other for a long time and often hang out. They slowly became like family. Evergreen and I have a deep relationship, which started when we did 2002's Where the Legend Begins together. Dexter got married in July, and of course he invited me to his wedding. That time I was shooting in Mainland, but I made time on my schedule to come back for his wedding no matter what it took. As for Lam King Kong, I also have a deep relationship with him. Our relationship may not be known by all, but people in the industry always say "there is no true relationships in showbiz", I think we broke through this saying. It's just that those people who says that, haven't encountered a true friend yet or perhaps they aren't willing to put their heart out to communicate with others. In fact, artists may not necessarily be 'fake' people!" Steven said Fala's personality is too straightforward, but Fala in turn greatly praises her god-brother. As an independent girl, Fala frankly said she had always been desperate to have a big brother. After coming to HK and meeting Steven, she laughed and said her wish 'half came true'. Fala said: "At the time, when I participated in Steps, I was one of the newcomers. Whatever he believed this little girl lacked...he would give me advice, especially on life principles. There are many things in life, he taught me to tolerate. When encountering such situation, I cannot just jump out and keep talking, being too straightforward can really offend people without knowing it. He's got a good social circle in this industry and experienced, of course I would listen to his advice. I'm also very thankful that he teaches me on how to handle things in life! I even told my mom about this big brother. Earlier at the Ghost Writer promotion, my mom came to HK to support me, and saw him there too. Although we haven't officially became god siblings, our relationship is still maintained well. Our interaction is very true and real. I know my brother doesn't care if its official or not!" I thought that Linda, Tavia, and Fala are really lucky that they had "found" their brother. They are really lucky to had met Steven. Steven is truly an amazing person and he put and uses his heart to help others. He is wise and he is always there for his sisters and others no matter what. Not everyone will take time and use their heart to speak and tell you the truth. So that is why I thought the three girls are definitely really lucky to have this brother. Congrats! 40 year old Gigi Lai is pregnant again! Yesterday she personally announced the good news on Weibo and thanked all of her friends and fans for their good blessings. This time, it is suspected that she's trying to go for a 'Dragon boy' and possibly get another set of twins. July 2010, Gigi had twin girls with her businessman husband Ma Ting Keung. After having her two daughters, it was rumored she wanted to go for a boy and hired a famous doctor to help her with artificial insemination (IVF). Last month on the 21st, it was reported she's 3 months pregnant via IVF and was rewarded by her husband with a mansion in Clear Water Bay. At the time Gigi indirectly denied that she's having babies because she's materialistic, and expressed Mr. Ma loves children. She promised: "If I'm 3 months pregnant, I will definitely let you all know!" Gigi kept her promise and announced on Weibo yesterday at 11am: "I am very grateful! Yesterday the doctor confirmed that I'm pregnant!" She attached a photo of herself smiling sweetly. After Gigi announced the news, last night there were over 15,000 re-posts by fans on Weibo and nearly 10,000 comments. Fans were very happy for her and sent their blessings, hoping that her wish to have a boy comes true and that she really does have twins again. Good friends from the industry sent their blessings as well including Cathy Tsui, Christine Ng, Gillian Chung, Yoyo Mung, Monica Chan and more. Gigi was especially happy and shared a sample of her delicious food on Weibo. In the photo, there were several different cakes and high-calorie cotton candy, she laughed: "I finally have an excuse to eat a piece of cake!" Ada Choi told her: "Eat more! Eat my share too!" Gigi quickly responded: "Sure." The other day, Gigi also shared a photo where she and her twins were playing at the theme park. "I like the innocence, sincerity and simple-minded thoughts. The more simple a person is, the happily their lives are!" There are many songs that I enjoy very much from TVB. And yes, I have a collection of theme and subs songs. What song do I listen to in my daily bases? TVB songs, they are the only songs that is in my ipod. I want to share with you guys my picks of TVB top ten songs and from those top ten I'm going to chose top 5. From the list above, I'm going to chose my all time favorite top 5. I'll be back with a All Time Classic Theme song. 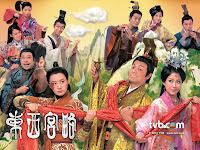 Cast: Kent Cheng, Sunny Chan, Sonija Kwok, Bernice Liu, Wayne Lai, Rebecca Chan, Leila Tong, Lee Heung Kam.. etc. TIK YAN KIT [Kent Cheng Jut Si], one of the most celebrated chancellors, is greatly trusted by Empress MO TSAK TIN [Rebecca Chan Sau Chu]. TIN’s nephew MO SHING CHI [Wayne Lai Yiu Cheung] is jealous and he seeks every opportunity to frame him up. CHI accuses KIT for colluding with his daughter TIK CHING LUEN’s [Bernice Liu] husband SUNG TING YUK [Sunny Chan Kam Hung] of treason and an attempt to subvert TIN’s throne. KIT is left speechless and his family members are all seized in order to TIN has been incited to action by CHI. KIT escapes in chaos but CHI threatens to kill his second wife CHO YUET [Sonija Kwok]. The incorruptible and intelligent KIT is miserably caught in a dilemma and he feels helpless in every way. Would KIT be able to conquer the traitors eventually and help restore order from a tragic turnaround? I had already saw this when it came out in 2009. Read my reviews at GOAH or simply under the Greatness of a Hero tag. Winter Love is updated!! Chapter 6 is finally up and currently working on chapter 7! !